Removes 90% or more of total chlorine for a healthier bath. Approximate life span: 200 baths or one year. The Multipure Aquasplash Bath Ball includes Crystaline Quartz technology in its media for an energized bath experience. When water comes in contact with the media filament inside the fabric pouch, the chlorine ions in the water are converted into a harmless chlo- ride. The toxic effects of chlorine, chloriamines, and chlorine gas are eliminated with the aid of a special media called KDF-73 in filament form. The media is 70% pure copper and 30% pure zinc. Chlorine is removed quickly when the Crystal Ball is circulated through the bath water. The crystalline quartz mixed with the media reduces the molecular structure of water into smaller clusters enhancing sudsing and lathering of soap. The Crystal Bath Ball dechlorinates the water when you circulate it through the water with the attached 12-inch cord for a few minutes. For best results, do not hang ball from spout while filling tub. Important: when using bubble bath, oils, salts, etc, be sure to add them AFTER dechlorination is complete. 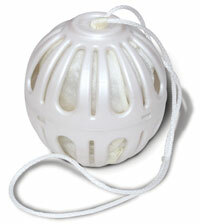 The 12-inch cord is also used to hang the ball on a hook or fixture to dry between uses. Please remove it from the bathtub before using the tub to avoid the possibility of stepping on the plastic ball. If you add more water to the tub while bathing you may swirl the Crystal Ball through the water for another minute or so to remove any new chlorine. Chlorine is a substance that chemically bonds to the protein in our hair and skin, destroying its natural ecological balance. It’s fine for removing stains in your laundry. However, chlorine can leave your hair dry and brittle and make your skin flaky and itchy. It can also trigger negative reactions in children, the elderly, and people with chlorine- sensitivity. Studies have shown that for health reasons it is best to reduce chlorine in drinking water. Why not do the same with our bathing water. The Multipure Aquasplash bath dechlorinator provides the benefits of Multipure water without the need for plumbing attachments - simply swirl the Aquasplash in the bathwater for 30 seconds to reduce the presence of chlorine. The Aquasplash is great for children, infants, and pets. This replacement bag is used inside the Aquasplash.